I love grocery stores. So it’s been an absolute nail-biter watching the new Fresh Market go up at the end of my street. I tour grocery stores on vacation. When I visit my sister Ellen in Dayton, I always squeeze in a visit to the fabulous Dorothy Lane Market near her home. A few years ago I found a wonderful grocery store near my Aunt Ruth’s house in California. I think of it often. Why didn’t I take pictures? But I am no shopping snob. I love my neighborhood Kroger and Paul’s Fruit Market as much as I do the high-end places only suited for special occasion grocery binges. About the only thing I like better than grocery stores is the big open food market in Barcelona where we bought bread, wine, and cheese every afternoon of our visit. We ate eat these for dinner in our little apartment: a different cheese every day, Spain’s fabulous wines, and baguettes that inspire poetry. So when The Fresh Market on Brownsboro Road near I-264 opened for the first time today, I was there 16 minutes later. The vegetable and fruit selection was impressive. I was delighted to see beautiful green beans – they tend to look like hell in a lot of places this time of year. The mushroom selection wasn’t bad, but there were a lot more dried varieties than fresh. Mushroom prices, of course, were astronomical, but some of the other produce was on par with Kroger. 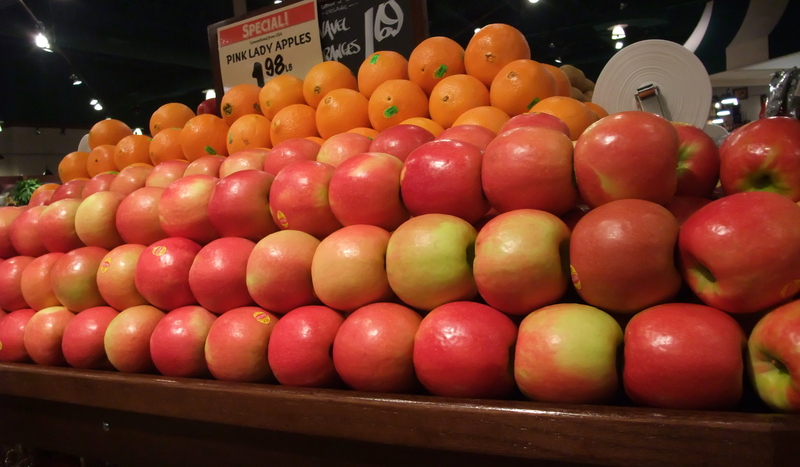 There were many out-of-season fruits in knockout colors, all for very high prices. The meats and seafood selections were more than complete and almost as lovely as the produce. I actually stood open-mouthed staring at the Maryland crab cakes, two for $5, until interrupted by a cheerful employee. All the employees were very chatty, warm, and informative. I’ll be interested to see if that vibe continues, and how deep it actually runs. It was very exciting to see not only flank steak – tough to find around here for some reason – and short ribs. Recipes danced in my head. The prices – no surprise – were almost uniformly high. Boneless skinless chicken breast was on sale for $2.99 a pound. I’d love to try them, but I can get them at Kroger or Meijer for a buck or so cheaper. Traffic flow in this store was exceptionally good. I’m a perimeter shopper, rarely bothering the prepared foods in the center aisles, and this store was ideal for me, while still seducing me through the bakery and freshly prepared foods. I didn’t buy the pot stickers they had on sale, though I was sorely tempted. This will be an experiment for another day. Whole Foods, which has a similar fresh prepared-food section, wins the Bland & Beautiful prize for theirs. I hope The Fresh Market cooks have a spice rack and a salt shaker and know how to use them. Of course for my introductory Fresh Market jaunt I explored the center aisles where a mixture of organic, natural boxed and canned goods was not so overwhelming that they left out the Cheerios — the fifth food group in my life. The bakery was pretty, with the fussy petit fours and tortes and cakes, but all made at some mysterious central processing factory. The guy at the counter didn’t know where that was. They do make some of the breads and rolls at the store. There was a generous selection of breads. I did not miss the scary blue and yellow cakes one sees at Kroger. Do people really eat those things? Fun and useless was a large candy section near the front of the store. I loved the colors, and even thought about buying my favorite chocolate bar, Green & Black Dark Chocolate, but that was clearly Satan talking. I only find Satan cute when we’re in the wine section. Kentucky grocery stores can’t have wine sections, so Satan’s pull was inconsequential and I saved the $3.95. Besides the bagels, I brought home those Maryland crab cakes. I’ll have them for lunch and let you know.